Calling the Move to 2840: What's Next? We may have hit a temp bottom on Friday. I think we see a corrective move up to 2840-50 area next over the next 1-3 trading days. How we act there at that zone will determine the next move. If we see a lot of calls being sold at that level, it will increase the odds that we are preparing for the next leg down. That and internals should give us some clues on what next. 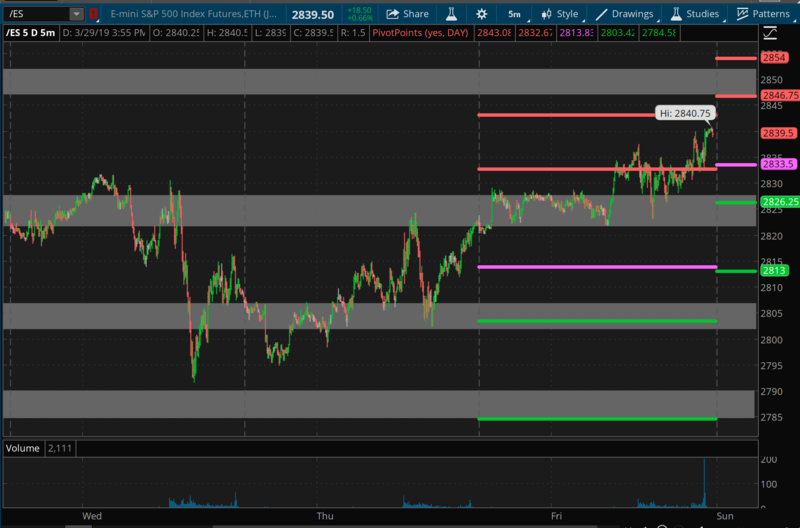 We had a little more bottoming action on Monday and then began a move higher to end the week at 2840 on the Emini S&P 500 (ES), the target I laid out last weekend. It was a weak up-move over the week. And there are a lot of mixed signs from the indicators we track in the Smart Money room. Options data is short-term bullish, but beyond a couple of weeks it looks bearish. So it's difficult this week to make a forecast on what to expect in price. But I think there is a decent chance for us to make a new high above 2866 near the 2880 area, although my confidence on this idea is not very high as of now. A look at our NYHL1M setup: Still on a buy, as it has been since Jan 14th from 2580 ES. ES Grey Zone areas: On the upside, first resistance comes at 2847-52 and then at 2865-70. On the downside, we have support at 2828-22 and then 2807-02. ES daily pivot is at 2833.5. Resistance R1 is at 2847 and R2 is at 2854. Support S1 is at 2826 and S2 is at 2813. Also NOTE: Trades and Indicator tables/pages are now live in the Smart Money room. Trade entries, indicator changes, etc., will now be posted as alerts in the SM room.